Dark Circles are by far one of the highly-requested skincare concerns from many men & women. At our adult ages and stages, the dark circles can come from many different things. Studies show they are hereditary, but dark circles can also come from aging, working behind our computers, stress, having that weekly glass of Riesling and not getting enough sleep. Good news is there are things we can do and products we can use to make them less noticeable. You really do need a good 7-8 hours of sleep. We tend to get caught up in the hustle and bustle of life, but even one good night of shut-eye can prove to not only help your dark circles, it can also give you mental clarity AND clear skin. Our skin is renewing itself while we sleep, so give yourself a little more shut eye and watch the blemishes and dark circles fade away. Rose and Cucumber both have rejuvenating properties and cooling effects to the skin. Using this all over your body is a great way to refresh the skin. One tip is to put the rose or cucumber water in the fridge to chill then soak 2 cotton rounds and apply to the closed eyelids for 15 minutes. This will help to soothe tired eyes and reduce puffiness around the eye. This one may seem so simple, but it’s truly a task to find your PERFECT eye serum. Since the eye area is super delicate, a gel or serum is recommended over the heavier eye creams. This crystal eye serum uses coconut and antioxidants to not only hydrate tired eyes, but protect from free-radicals as well. This one is great for heavy dark circles and it sets as a matte which can double as a primer under makeup. WIN! 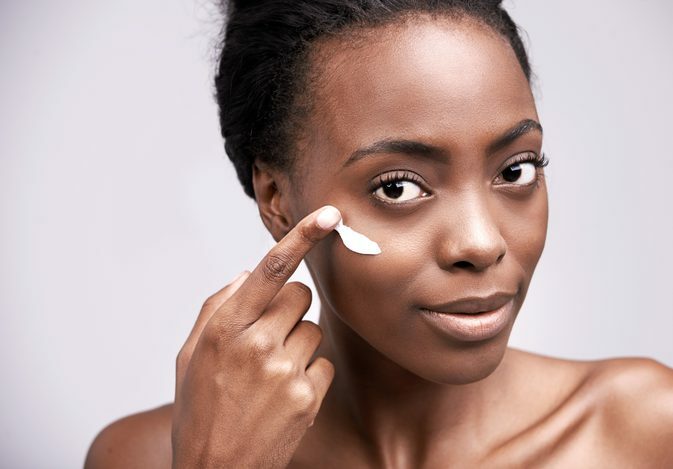 If you still have a hard time making a selection, you can also visit your local esthetician or makeup counter to try out a good eye serum before you make the investment. Have you tried any of these tips? What are your favorite eye products?